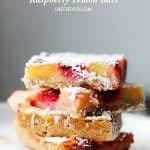 Raspberry Lemon Bars – Nutty cookie crust topped with a luscious lemon filling and studded with fresh sweet raspberries. 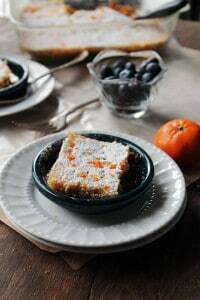 Bursting with flavor and texture, these Lemon Bars are not only delicious, but at 150 calories per serving, they’re also much lighter than your classic Lemon Bars Recipe. PUCKER UP! Hey Hi Hello! How do you do? Don’t worry, tomorrow IS Friday! AND today I am taking care of your sweet tooth. Win Win! But let me back up a little bit. Last Monday afternoon I reached over for my favorite pair of jeans… You know the ones… the jeans that never let you down, the jeans that look good with a pair of heels OR a pair of sneakers, the same jeans that look like new every time you wear themmmm…. Well. Those jeans. I guess they didn’t feel like being nice to me no mo’ and kinda told me that I had to lie down if I wanted to zip ’em up again. DAMN!! I blame it on winter. Seriously. This winter is so awful. It’s cold, it’s icy, it’s ridiculous and it needs to go bye bye bye! And I need to get back to running (read: walking) on the pavement and not on my treadmill while watching Real Housewives and sippin’ on Chardonnay. Kidding about the Chardonnay, though. Can you imagine running on a treadmill while tipsy?! That’d be fun! Soon after my run-in with the jeans, I went to the kitchen and stress ate a fun-size Kit Kat. Milky Way and Musketeers, too. Just one of each. Then I baked these Lemon Bars. It was therapeutic. I like these Bars a lot. 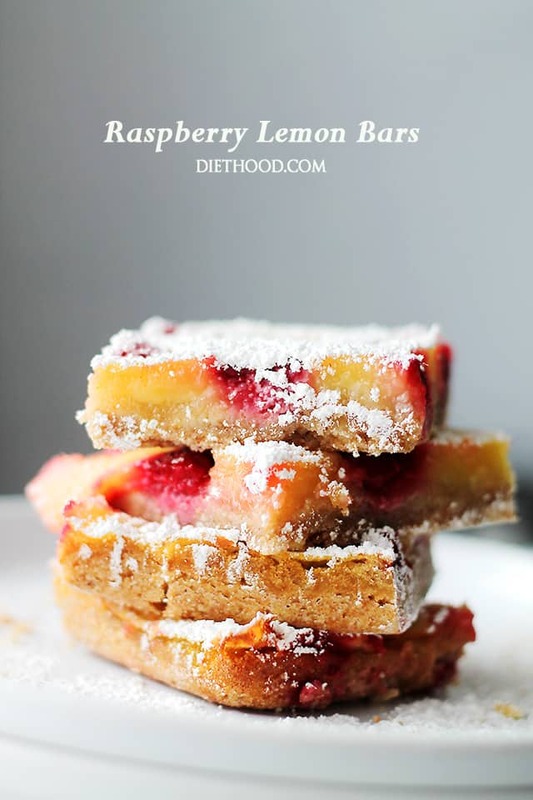 These bars are based in lemon juice and eggs, but also whole wheat flour. I haven’t used nearly enough whole wheat in my desserts, but them darn jeans are telling me to do so. But, you know, when you pair nuts with whole wheat flour, the taste is kinda amazing. The texture is even better. Let’s just let this happen. Let’s stick it to winter with a bright, citrus dessert while giving those jeans exactly what they’re asking for. Also? These Bars are most perfect for that 3 o’clock slump. Lightly grease an 8x8 baking dish with cooking spray and set aside. In a food processor, combine flours, powdered sugar, walnuts, and salt; pulse to combine. Add butter and oil; continue to pulse until mixture is crumbly. Add cold water and pulse until mixture resembles coarse meal. Transfer mixture to previously prepared baking dish and press into bottom of pan. In a mixing bowl, whisk together the sugar, 2 tablespoons flour, lemon juice, lemon zest, eggs and egg white; whisk until thoroughly incorporated and smooth. Remove baked crust from oven and let stand 2 minutes. 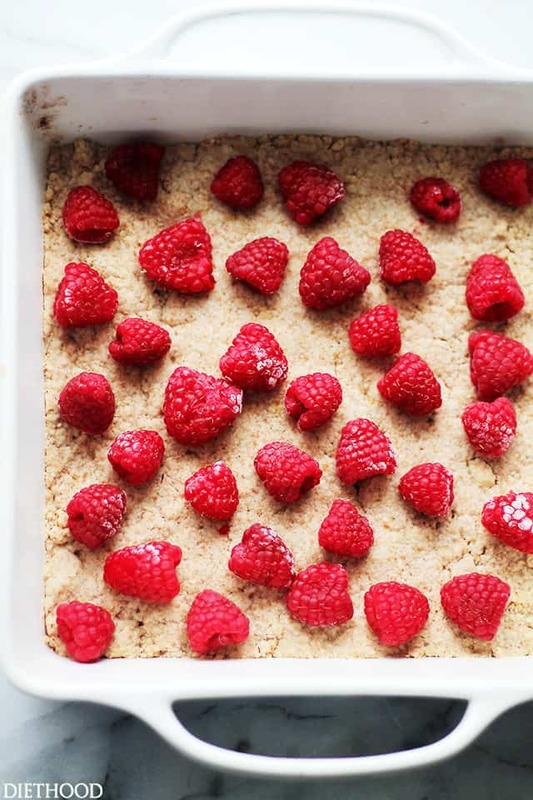 Arrange fresh raspberries over the baked crust. Pour lemon mixture over raspberries. Bake for 22 to 25 minutes, or until topping is set. Cover and chill in the freezer for at least 1 hour. Optional: Place bottom of baking dish in a larger pan filled with hot water so it's easier to cut out the squares. Keep in hot water for about 30 seconds. My mom was just saying how I needed to make some lemon bars. This looks like just the recipe to satisfy her craving. I have never had lemon bars like this before. Love the raspberries. Giiirl, I am so with you. I wore some black jeggings the other day and caught my reflection in a window – they were SO TIGHT. Ugh. I need some serious workout motivation. I love these so much! Lemon bars are one of my favorites. 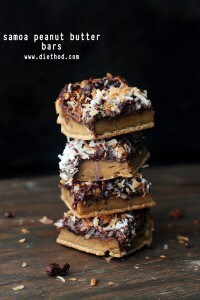 Definitely trying these! I am digging the lemon and raspberry combination. It sounds delightful! I think I would be sick if I tried to run while drinking haha! 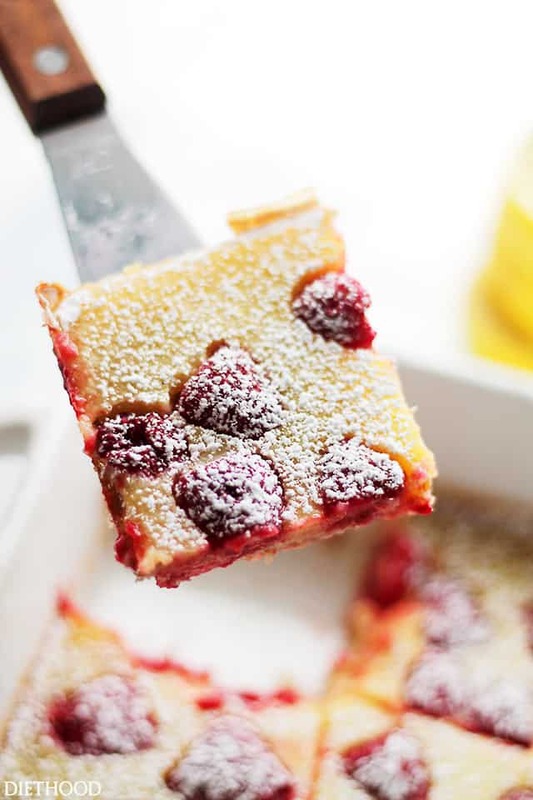 Love lemon and raspberry together, it’s one of my favorite combinations ever! 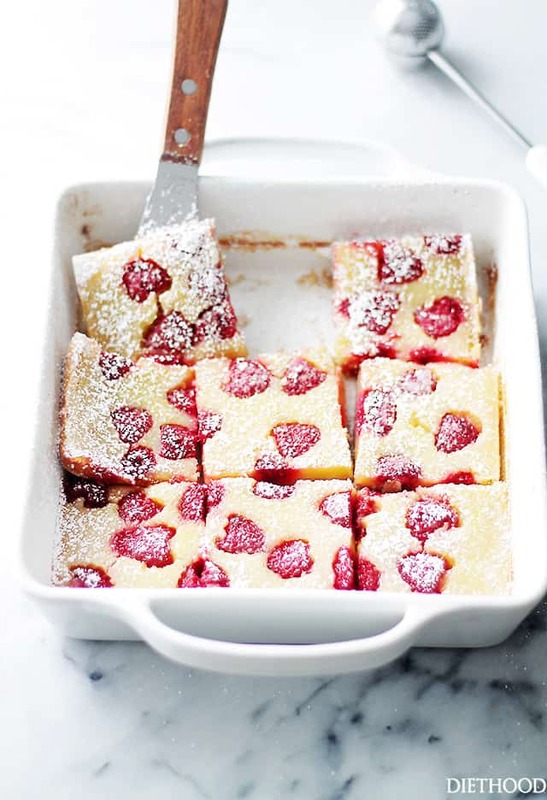 Whenever I read lemon and/or raspberries in a baking recipe I’m hooked instantly. Looks gorgeous! I’m trying to cut back on sugar though, but this seems very tasty 🙂 Might have to make an exception, or try stevia instead. Would that work? Hi Madeline! 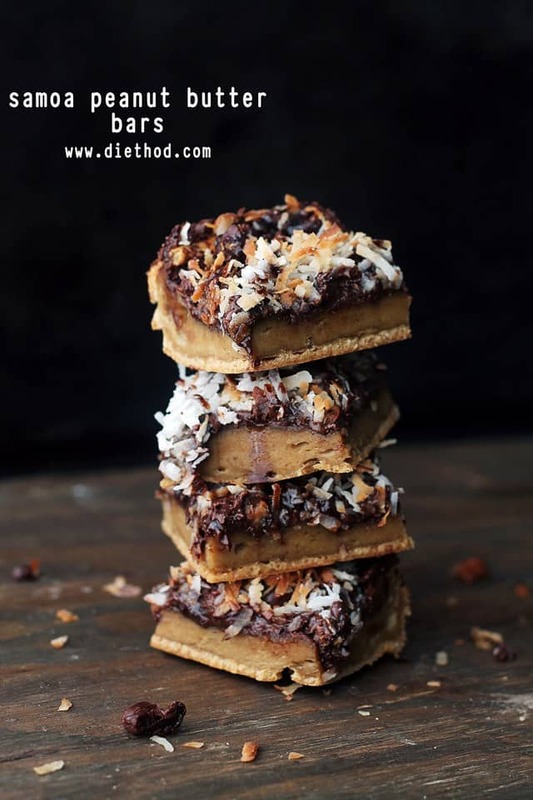 I honestly have no idea because I haven’t made it with Stevia, but I definitely want to try it. Loooooove these bars. Raspberries are my favorite! Me, too!! 😀 Thank you, Karly!